As hospitals fight to lower readmissions and avoid looming Medicare penalties, an in-home care agency steps in to bridge a gap in essential care. DELRAY BEACH, FLA., Sept. 10—Avoiding hospital readmission takes more than a committed hospital. It takes a committed patient. The national in-home care company Preferred Care at Home is empowering patients to take charge of their recovery with the help of a free 15-piece tool kit called the Personal Health Record. On average, one in five Medicare patients discharged from a hospital checks back in within a month. Avoidable readmissions are such a problem that in October, Medicare will start penalizing hospitals that have high readmission rates. Over 2,000 will be affected in this first round—two-thirds of the hospitals evaluated, reports Kaiser Health News. Yet, even with this incentive, hospitals are having trouble reducing readmissions. That’s largely because many things that put people at risk for readmission happen not at the hospital but at home. Patients misunderstand confusing instructions, don’t get prescriptions filled and neglect follow-up appointments. They need help understanding and remembering what to do. This is perhaps especially true for elderly people, who may be more likely to live alone and frailer to begin with. The Personal Health Record also includes a going-home checklist and an extensive, easy-to-read emergency plan that shows which symptoms need a 911 call and which can wait. Right now, Preferred Care at Home is offering the Record as a free download at their website, www.PreferHome.com. The Personal Health Record also helps bridge communication gaps between health-care providers. Patients can take it to follow-up appointments, and the providers will all see the same up-to-date, accurate, thorough information. This allows for more collaborative care. The Personal Health Record is part of Preferred Care at Home’s overarching readmission solution, Smooth-Transition Care. With this service, clients get a personal coach and secure online storage of the Record so family member and health-care providers can easily access it. 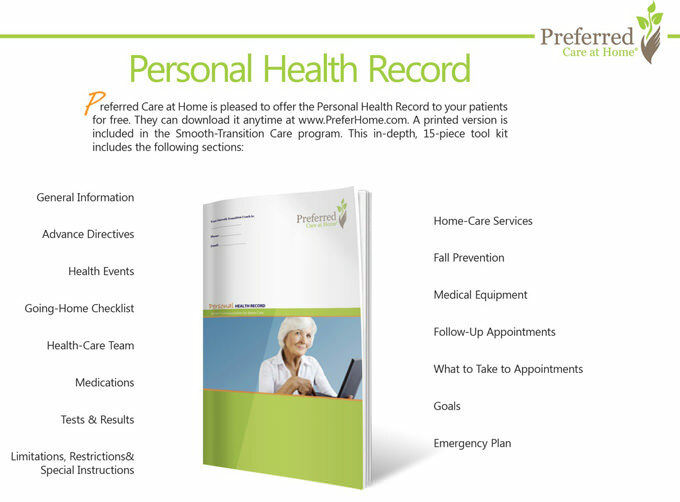 To download the free Personal Health Record or learn more about Smooth-Transition Care, visit www.PreferHome.com or call (561) 455-2627. Since 1984, the family-run home-care company Preferred Care at Home has been dedicated to providing reliable, compassionate and affordable in-home care. This care improves quality of life while safeguarding independence and dignity. Services include companionship, meal preparation, hygiene assistance, medication reminders, transportation and more. Preferred Care at Home is a nationally franchised company based in Delray Beach, Fla.